Are you worried about flying with your preschooler? Wondering what to pack to keep your little one busy on the plane? I’ve got you covered! In my experience, preschoolers (ages 4 & 5) start to become significantly easier to travel with. They can sit for longer and stay entertained with one thing for more than 5 min (mostly!). And, if you’re lucky, you’ll be able to reason with them a bit too!! But, this doesn’t mean you shouldn’t be prepared. If you involve them in the process, and talk about your adventure ahead of time, it will make the process much smoother. Whether your flight is one hour or ten, having the right stuff on board will help keep your preschooler entertained and well behaved. Here’s my use have list of what to pack when flying with preschoolers. A sense of independence is incredibly important for all kids, but especially once they get to preschool age. Help your preschooler pack all the things she’ll need for the plane in her own backpack. She’ll know exactly what she’s got and where it is, and it’ll give her a sense of responsibility for taking care of her own things. Plus, they look super cute in their little travel backpacks! We started our kids carrying ALL their things in their backpack starting at the age of 4. This included clothes and toys. (We’d still take extra shoes, toiletries and bathingsuit/towel). Its worked great so far and they recently carried all their things on their back for an entire year during our family gap year! If I could impart one pearl of wisdom, it would be to get your kids a backpack and encourage them to carry their own stuff as young as possible. We love our Osprey packs! 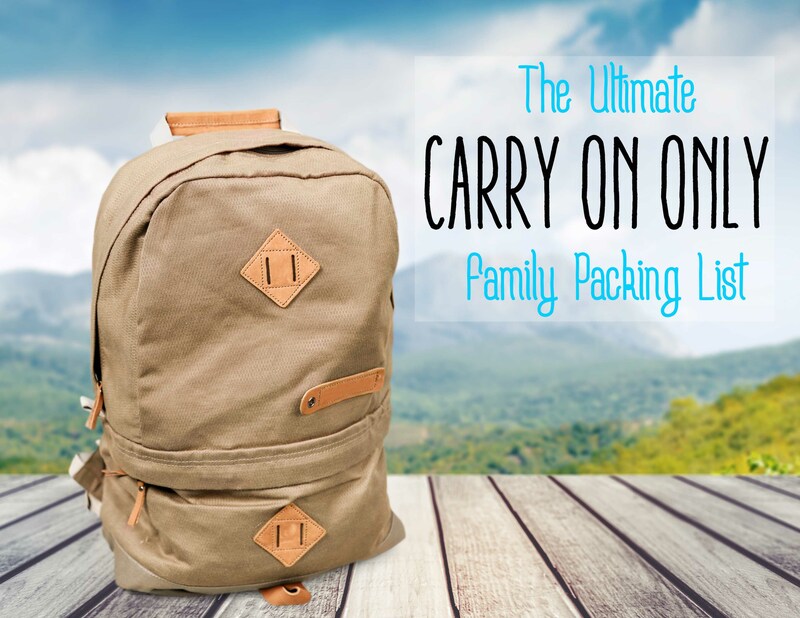 This is our favourite backpack, with our must-have items! 2. Keep Them Fed – Pack Snacks! Snacks are 100% necessary on the plane. Some flights have snacks on board, or snacks for purchase, but that doesn’t mean they’ll be available when you need them! Snacks also provide a great distraction and keep your preschooler from getting hangry. A few packs of fruit snacks and some granola bars are all you’ll likely need. We do often buy snacks on board, and our girls have now come to associate “Swedish berries” with flying on Air Canada! It’s nice to buy snacks on board, but I also really appreciate having a few others for take-off and landing. And, I have them when I need them instead of waiting for the cart! We’re trying to be as environmentally friendly as possible, so I always pack snacks in my favourite little Bumkins reusable snack bags. They’re super easy to clean (just turn them inside out and wash in the sink with your dishes, or throw them in the washing machine! ), and they come in a bunch of cute little colors. The small ones are the perfect size to fit inside the kid’s backpacks! The drink cart is an integral part of the flying experience, but it never fails that something ends up spilled. Small cups on a bumpy plane in a small space are a recipe for disaster. We’ve had our fair share of spilled sprite (I would only let the girls have clear beverages to avoid the mess!!) on many flights before I got smart! I recommend bringing a small drink-cup with a lid and straw, or a sippy cup of some kind if your preschooler will still use it. This’ll decrease your chances of using the spare change of clothes! The other reason I love bringing our own drinking cup, is it eliminates the plastic cup use on board. I’d rather wash out a reusable cup than throw out a handful of plastic cups from the plane. These are my favourite kid-friendly water bottles that work great on the plane! If you have checked luggage it’s always a good idea to have a spare change of clothes in the carry-on bag. I recommend a complete change of clothes (shirt, pants, underwear) for you child, and at least a spare shirt for yourself. During our worst travel disaster, Calais (my eldest), threw up on herself twice and me once. To this day I’m still sure she must’ve had a stomach bug, because in the hundreds of flights she’s been on this is the only time she’s been sick! She ended up leaving the plane in her sister’s spare clothes (because she threw up on her own spare clothes after throwing up on her original outfit!). I left the plane wearing my friend’s undershirt. Thank goodness we were traveling with friend! Anyways, the moral of this story is to ALWAYS make sure you have some spare clothes! A movie is a great way to spend an hour or two on a long flight. Almost any kid will be happy with these CozyPhones kid’s head phones, or a big pair of bluetooth over-ear head phones. They both tend to take up a fair amount of space in the backpack and are pretty awkward to pack. By this age your preschooler’s ears are big enough to fit kid-sized ear buds, which is my preference. One of the major benefits of earbuds is that they can be in-ear for take-off and landing as long as they’re plugged into the airplane’s entertainment system. The Ety Kids earbuds are comfortable and have volume-control so they’re safe too. We’ve traveled with these for many years now, and have gifted them to all our friends! I can’t imagine trying to pack anything bigger than this! An iPad/Smart Phone/Tablet all come in handy when flying. They don’t have to be stored during take-off and landing so they can fill the time when the seatbelt sign is on. For short flights, some pre-downloaded movies on a tablet, or a few games on a smart phone is really all you need. We’re an Apple family, so our girls have always traveled with games, movies and books downloaded on their mini iPads. I’ve also heard great things about the Kindle Fire Tablet for this age as well. The kid edition is definitely safer than it’s Apple counterpart. A few of my favourite games: Toca Boca (any of them, they’re all great! ), Mee Genius and Peppa Pig’s Golden Boots. To find more age-appropriate apps, there’s a great list HERE! The Leap Reader is one of those toys we reserve for airplanes only. The books are a bit expensive so I don’t want the girls to get bored of them. The reader has a headphone jack so everyone on the plane doesn’t need to listen to the story, and each book has activities to go along with it providing more entertainment than just the story itself. It also has lots of memory so I can download all our books onto both readers and the girls can share. Luckily at this age you don’t need to load up with too many distractions. The following are my favourite non-electronic toys and distractions for the airplane. We don’t go ANYWHERE without Lego, it’s an absolute must-have for us and provides hours of entertainment on flights. We have a small container with a baseplate on the top. It’s been rigged up with anti-slip car cell phone mats so it doesn’t get bumped off the tray-table as easily. the cell phone mats don’t keep their stick forever, but we usually can get a few trips out of them. When they start to get gross, I just wash them in the sink, let em dry and use em again (until they rip!). It’s amazing what a young imagination can build on a little baseplate. We started with a large Lego classic baseplate and cut it down to fit the size we needed. We’ve made multiple versions of our lego holder over the years, both hard and soft cased, and with various things to help them from slipping on the airplane tray. Other than the sticky factor, the cell phone mats work surprisingly well! I picked up a pair of these little Jot 4.5 Boogie Board eWriters a few years ago and they’ve been amazing for traveling. They’re great for just drawing on, or you can play games like hangman and tic-tac-toe. I usually pack a spare just incase one gets left behind! Many of the newer Boogie Board don’t come with a cover, so be picky when you purchase (the one I’ve linked to above does have a cover!) Just make sure the kids put the cover on when they’re done using their boogie board or the screen can easily get wrecked. We try to avoid disposable items as much as possible, but sometimes the kids just want to colour. I think it’s good for their development, and it’s something other than a screen so I relax a bit with this one. The dollar store, Target or Michael’s Crafts usually has little $1 play packs with 4 crayons, a few stickers and a little colouring book. They’ll usually last for a return flight, and they’re small enough to throw in my purse for any needed entertainment while we’re traveling. Plus, for $1, they’re pretty disposable. Read More: Check out these 21 airplane activities for preschoolers and toddlers if you’re looking for more! Check out my “Tips for Flying with Preschoolers” to make your flight easier.